APPARENTLY ENOUGH was enough. In an impressive show of force, Mother Nature initiated her own ecosystem restoration project by removing a 71-year-old dam that might have otherwise remained for many generations. The twice-a-day surge of ocean water up Marsh River in Newcastle, Maine, was probably never going to regain its entire valley; the tidal energy was too diffuse by the time it reached the earthen dam that created the 237- acre Sherman Lake. There had been nearly 52,000 tidal surges and countless floods since 1934 and yet the dam held. Tidewaters needed to enlist help from above, and in October, help arrived in the form of more than seven inches of rainfall that poured off the rural landscape and breached the dam. 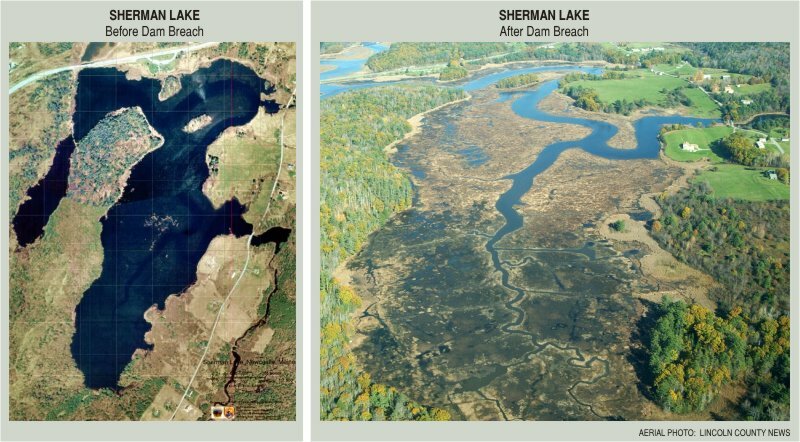 For the first time in 71 years, Sherman Lake emptied and the upper Marsh River resumed its ancestral rhythm of ebbs and flows. The reaction from the local community was mixed. This ecosystem upheaval had some ugly consequences, but at the same time provided amazing opportunities to learn about restoration. At the center of it all - literally - is the dam itself. 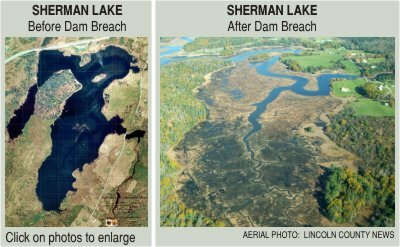 Should the dam be rebuilt to restore the lake, or should the dam be left breached to restore the salt marsh? No conservation-minded person wishes death on a lake’s worth of creatures, but isn’t that an inevitable consequence of replacing an ecosystem with something new? Restoration can just as easily be viewed as destruction, depending on what you value and what the outcome will be. Thoreau described a lake as “…the landscape's most beautiful and expressive feature. It is earth's eye; looking into which the beholder measures the depth of his own nature.” Some of that depth comes from a strong connection to the land where we spend our lives and raise our children. My own life was shaped by the endless hours I spent canoeing, swimming and skating on Damariscotta Lake, only a few miles from Sherman Lake. When I return to its waters - nowadays only once a year - its details are as familiar to me as ever. I can visualize the exact pattern of pickerelweed in my cove, the oar handles seem to have been carved to fit my hands, and I know where to catch bass because I’ve fished nearly every inch of the lake. If the lake were to drain into the sea and my fishing grounds become meadows or marshes, a large part of my foundation would be eroded. Sherman Lake may be smaller than Damariscotta Lake, but the size of a lake has little bearing on the passion that some people feel for it. I know how much local residents valued Sherman Lake, just as others might value a 200-year old oak tree in the town common, or the local traditions of town meetings or county fairs. A landowner along Sherman Lake may no longer hear the mating song of bullfrogs echo across the valley, or continue the tradition of pick-up hockey games, or teach their grandchildren how to fish from the same wooden dock they had fished from for decades. Can we console these people by saying that salt marshes are productive ecosystems? It is not about what’s better - salt marshes or lakes - but respecting the people who value these resources. Besides the effects on people, there were profound ecosystem changes when the dam breached. The event will alter everything from sediment chemistry to microbial communities to processes such as decomposition and nutrient cycling. The freshwater fish community in the lake perished quickly, except perhaps for juvenile alewives that were already prepared for seaward migration and the transition from freshwater to saltwater. If you were ever curious or cruel enough as a child to put freshwater fish into a bucket of salt water, then you understand what happened to the bass, pickerel, and perch of Sherman Lake. Benthic macroinvertebrates, including freshwater mussels, snails, crayfish and dragonflies, also perished quickly. Frogs and turtles had already begun hibernating in the lake bottom and were likely unaware of the cataclysm that was unfolding, but they too became freshwater-derived nutrients for marine and terrestrial food webs. Some mobile creatures may have been able to swim toward the upper end of the lake to the small tributaries to avoid salt water or desiccation. Others could have hopped or crawled overland to find new habitats. But because the event occurred in October when many organisms were entering a period of dormancy, many were not capable of escaping the tides or responding to being dewatered. Nor were there other nearby lakes for them to escape to. Sherman Lake was Newcastle’s only lake, and with it went a significant piece of the town’s biological diversity. Now that the lake is drained, Marsh River has begun to massage its ancestral upper valley with daily tides. A new ecosystem is emerging - at first fueled by the remnants of Sherman Lake, but someday soon, one that will look like, and be in equilibrium with, salt marshes of the lower Marsh River. Ebb tides carry bits of pickerelweed and water lilies down Marsh River to be processed by detritivores, and gemmules of marine microbes and plants are carried upriver. The first marine colonists were likely subgroups of Proteobacteria called Roseobacter or Alteromonas; these are ubiquitous and the most rapid colonizers of surfaces in coastal areas. They will form a biofilm over most surfaces and pave the way for other microbes and detritivores. Sponges, hydroids, and bryozoans will begin to form colonies on these surfaces. Plants such as spike grass, glasswort, salt marsh hay, smooth cordgrass, and black rush will become established during the next growing season and begin the long process of rebuilding the salt marsh peat that was destroyed more than 70 years ago. A variety of crustaceans - shrimp, scuds, and crabs - will quickly colonize the valley and become a critical link between the vast amounts of detritus and higher trophic levels. Worms, clams and possibly even native oysters will colonize the sediments, and by doing so, contribute to the physical and chemical nature of the new estuarine sediment, providing microhabitat for other species, and providing food for predators. Mummichogs, silversides and sticklebacks will be the first fishes to move into the valley. Striped bass will chase alewife and eels upriver at high tides. Sandpipers, terns and herons will forage in marshes and mud flats, while eagles and ospreys watch from nearby aeries for more substantial prey. Someday rare species - such as salt marsh sparrows, yellow-crowned night herons or clapper rails - might return and provide excitement for local naturalists. All of these changes are exciting for those interested in ecology. Rarely do we get to see a large-scale shift from one ecosystem to another and witness every step of the process. Students at Lincoln Academy - my alma mater - are getting an unusual chance to observe a natural science experiment that they could never have appreciated from words printed in a book. But in all the excitement we shouldn’t forget that there are people who felt a deep loss when their lake became a sinuous channel, and feel resentful that the loss of their lake is heralded as a great opportunity to restore a salt marsh once lost. Few would have advocated the purposeful removal of the dam to lose a lake and gain a marsh, but it happened anyway. In late January, the Maine Department of Transportation announced that it would not rebuild the dam, and would collaborate with public agencies and others to return the area to its former condition as a salt marsh and tidal creek. The first step will be to remove remnants of the dam to restore full tidal flow to the marsh to enable the ecosystem to be rebuilt and discourage invasive species from gaining a foothold. Dams, tidal restrictions and dredge/fill projects have destroyed thousands of acres of salt marshes along Gulf of Maine’s coastline, and, along with development, continue to degrade more than 20 percent of all remaining salt marshes. Construction of tidal barriers or outright wetland filling often occurred decades or centuries ago. Once-productive salt marshes and tidal creeks have become agricultural lands, residential and urban areas, freshwater marshes, and lakes. We have come to rely on these new resources and to see them as natural, even though in many instances they depend on the integrity of the structure that restricts tidal flow. Sherman Lake was created in a misguided attempt to control mosquito populations during a time when there was limited knowledge about ecology and no regulations regarding wetland alteration. Such a dam would never be built now because we have come to appreciate the value of coastal wetlands and the damaging effects of tidal restrictions and dams. Throughout the Gulf of Maine, there is a growing desire to reconnect watersheds to give native species a chance to regain lost ground. In many cases, it will be impossible to reconnect watersheds because there is not enough societal motivation to make the difficult decisions about removing dams - particularly dams that have created new habitats that some people have come to value. Mistakes of the past will constrain progress toward restoring native ecosystems. A heavy October rain undid a mistake of the past and allowed the Marsh River to regain its valley. Newcastle’s residents may have never voted to remove the dam, but that does not mean that the dam should be replaced. In 71 years, children will hardly believe that the Sherman Marsh was once a lake. Nearby residents will mark time with the tides and find comfort in the predictability of its seasonal rhythm. Ethan Nedeau is a science translator and illustrator for the Gulf of Maine Council. He can be reached at ethannedeau@comcast.net.